I was superhappy to finally find this record at a reasonable price in Puerto Rico last month! 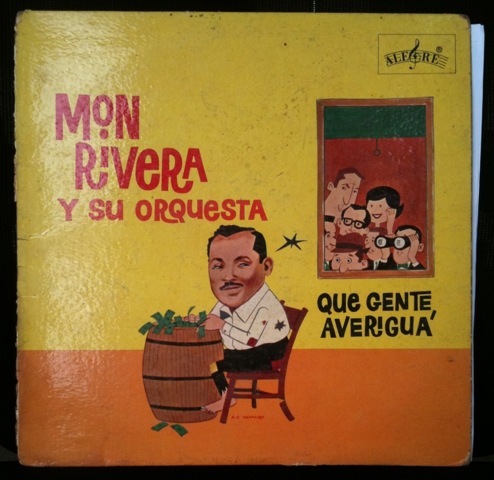 Mon Rivera’s monster track Lluvia con Nieve has always been a Pelanga favorite – from Eddie Palmieri’s badass piano intro, to the horn section consisting of a trombone, a trombone, and a trombone, to the eloquent lyrics on the boricua experience in Nuebayol (“Lluvia con nieve, lluvia con nieve, lluvia, nieve, lluvia con nieve”.) If you like the hard-hitting, trombone-heavy sound of the salsa orchestras of the 70s, say thank you to Mon Rivera y su Orquesta – they were doing this in 1963, you understand? This entry was posted in LA PELANGA TV, PELANGA RECORDS! and tagged Mon Rivera, Plechanga, Plena, Puerto Rico, Salsa, Trombanga by Papicultor. Bookmark the permalink. adjoa, it’s like mayagüez scatting, no? google "mon rivera trabalenguas"!i feel like we have that "drums of defiance" cd hidden somewhere, time to dig it up again – haven’t heard it in years.marcos, i’ve been sleeping on descarga.com, there’s a lot of filler in there, but there’s some great content too!tunda, más mon!